Notting Hill Carnival - Europe's biggest street party! Do you ever feel like dressing up and dancing in the street? 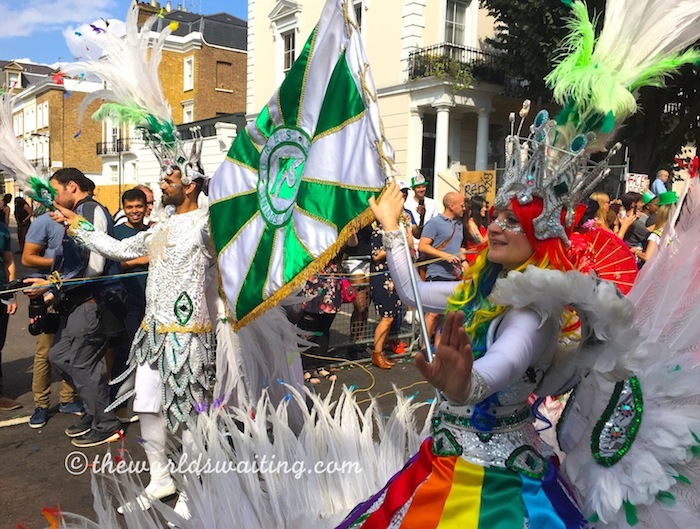 Every August bank holiday weekend the streets of west London come alive with one of the biggest and most colourful celebrations of life imaginable. The much-celebrated Notting Hill Carnival has been partying through west London since 1966 and if you think that sounds fun, just wait until you experience it! 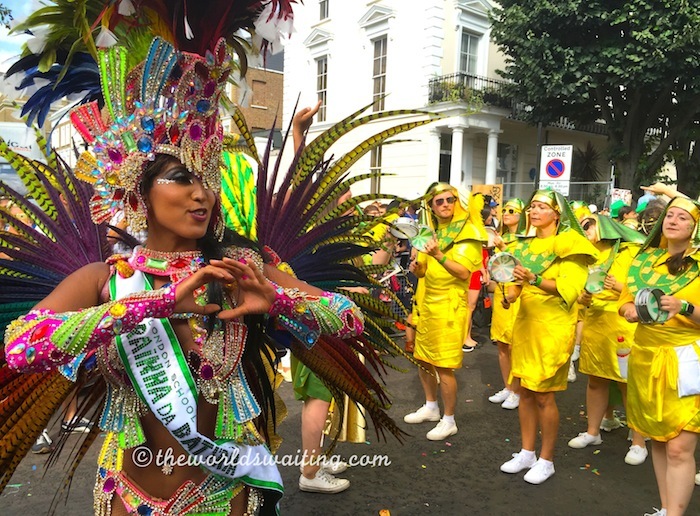 The Notting Hill Carnival is one of my favourite events in London. 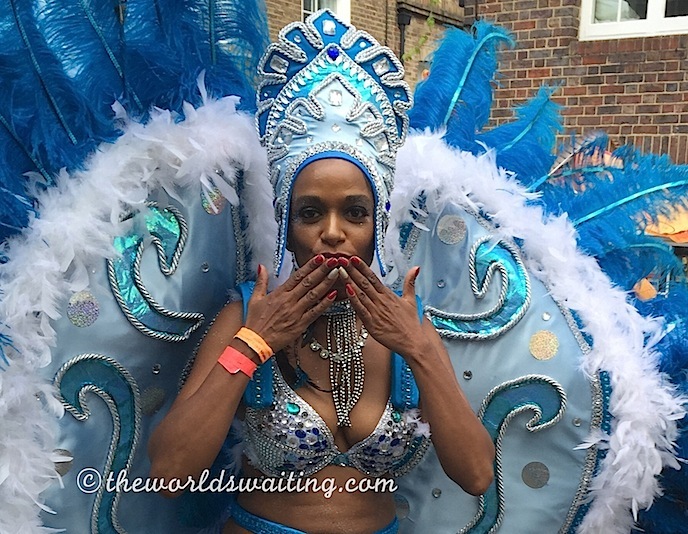 Hundreds, possibly thousands, of people from the British West Indian community take part in Europe’s largest street party each year. 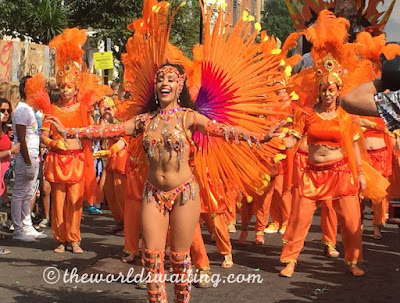 People from Trinidad, Tobago, Jamaica, Barbados, the Bahamas, British people with family in these nations and others take part in carnival, resulting in a fantastic blend of West Indian music and a great and party atmosphere. Dressed to the nines, in all sorts of elaborate and colourful costumes, partying people parade, dance, and boogie along the route. 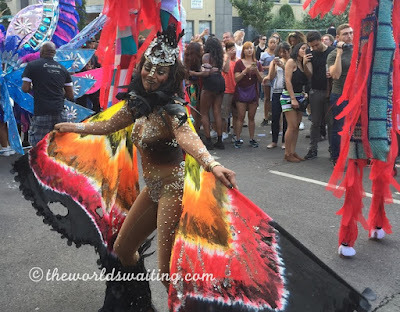 Some flit and dance along in super skimpy outfits mostly involving jewelled bikini tops, thongs and fluff, but often with tremendous feather wings, masks and headpieces. Other folk cruise more slowly along the parade route encased in gigantic and impressive structures that catch the eye from miles away. Hundreds of floats, often representing community groups, ply the route blasting out reggae, soca and steel band music so lively you can’t help but smile and bop along as they pass. Words really can’t explain how much fun it is. Check out this video to see what I mean. The parade follows a long route around several west London neighbourhoods and the music can be heard several blocks away, so it’s easy to know when you’re getting close to the parade. Furthering the merriment, the carnival route is lined with vendors selling rum cocktails and Red Stripes (Jamaican beer). Food stands sell Caribbean specialties like jerk chicken, rotis and goat curry. There are also stands selling West Indian flags and accessories like hats and whistles so you can join in with the partying! The carnival involves lots of road closures and some London Underground stations are exit-only during carnival to ease pedestrian traffic. This is an event where it is really worth deciding your arrival and departure route before making the trip. Best to check information in newspapers and on Transport for London’s website. If you’re heading to an airport from the Notting Hill area at any time during the bank holiday weekend (the last weekend in August) I suggest taking a London airport transfer, from somewhere well away from the parade, as local public transport options will be super busy from Friday through until the end of Monday.